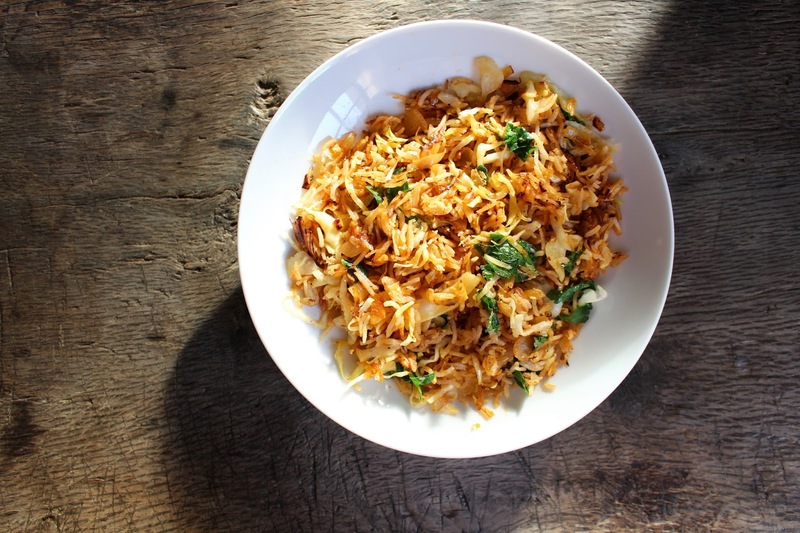 I first heard about kimchi fried rice while watching Ina Garten's show on the Food Network back when I was living in London in 2012. On this episode, she went to see several of her chef friends and asked them what their favorite comfort meal was after work (mind you, I watched this a long time ago so it was something along these lines, correct me if I'm wrong). 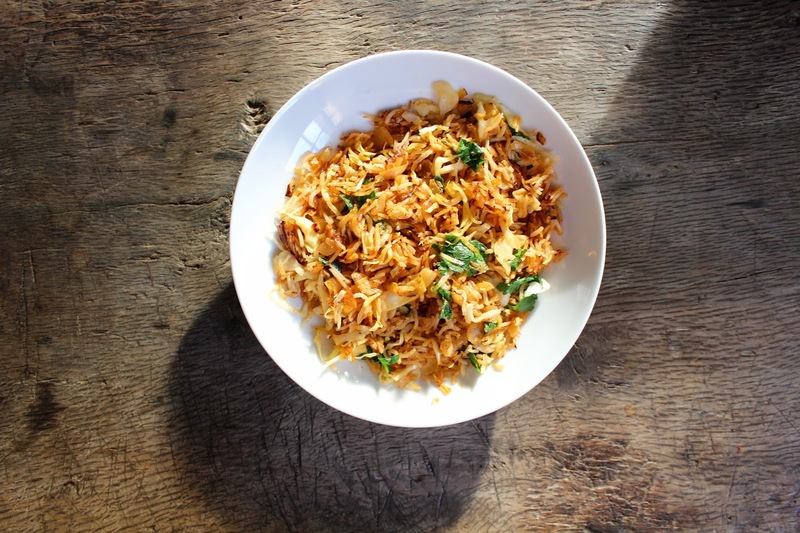 So this chef friend showed us how to make kimchi fried rice, and it looked so so great. Ever since I watched that episode, it stayed in the back of my mind but I had neither tasted or made kimchi fried rice up until last week. I went to South-Korea in December and brought back a big supply of kimchi, so it was the perfect moment to test this recipe and make it my own. Kimchi is a traditional side dish in Korean cuisine. It is made of fermented cabbage (or other vegetables), to which a few seasonings have been added such as salt, garlic, chili etc. There are many different varieties of kimchi, some can be extremely spicy while others are mild. Kimchi is definitely an acquired taste, similar to sauerkraut. So not everyone appreciates the - often strong - flavor of kimchi. I'm one of those people that absolutely loves it, so those few days spent in Seoul eating kimchi were heaven! Dice the onion thinly. Heat some olive oil in a pan, add the onion and fry until it starts to brown. Then add a teaspoon of gochujang and stir it together with the onion. Add the rice and stir well. Leave to crisp for a couple of minutes while you slice the kimchi into small pieces. Add the kimchi, pepper and maybe some salt to taste. Stir again and let it fry for a couple of minutes. I added some very thinly sliced oxheart cabbage, in the end, to add a nice crunch and something "fresh" to the rice while also sneaking in some vegetable. I also like to add some fresh parsley to add a hint of green and I feel like the flavor goes well together with kimchi. I had this for lunch one day, but it would also make a perfect side dish. Kimchi fried rice is usually eaten with an egg on top, but since I try to make my home-cooked meals vegan, I skipped it. I love the spiciness of this dish, it's really warming and comforting. I can't believe it took me so many years to finally get around to re-creating the dish I saw on TV, it's super simple. 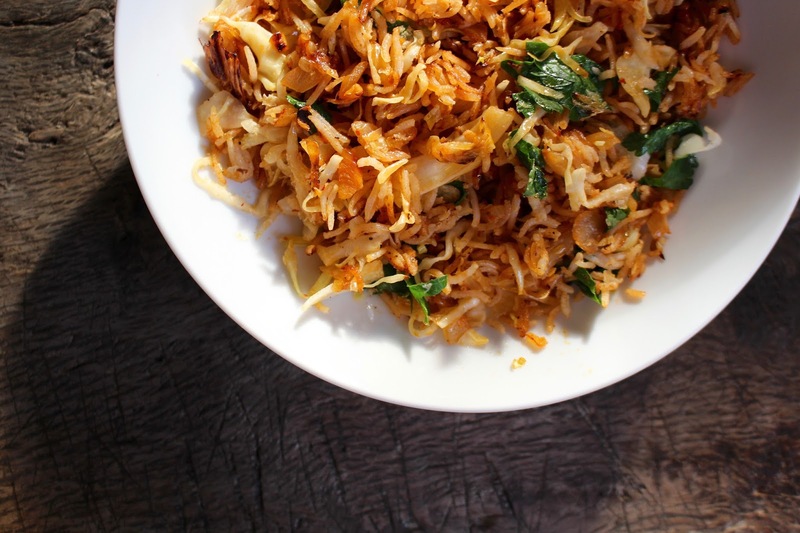 Especially for kimchi-lovers, this is a fun dish to eat kimchi in a different way!